Honda Civic Safety & Braking Pros and Cons | Page 1 of 1 | Why Not This Car? What drives people to buy (or not buy) a certain car? TrueDelta's members share Honda Civic pros and cons based on their real-world driving experiences. In addition to offering a full array of safety tech at an unusually low price, the new Honda Civic aced its crash tests. The 8th-gen Civic Si sedan. 8000rpm never gets old. I'm sure it's not-so-safe by today's standards. I can still see out of it, so I guess I could die in a crash since the doors don't completely cover my shoulders. Nevertheless, the Civic Si was distinguised at the top of its class when it was built. Brakes are adequate, but seem a bit underpowered. Safety ratings were good. I liked that full front and rear side-airbag curtains were standard on all trim levels. Braking is good, as expected. 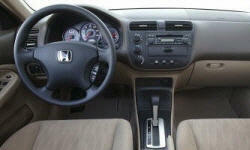 Honda has made strides to achieve 5 star ratings in all crash tests, definitely a factor when choosing this family car. Brakes feel adequate but nothing spectacular. Well I had a pretty nasty crash in mine. 40+mph offset + a rollover. I walked out of it with some scratches. Id be dead in my older car I think. Those side curtain airbags are a life saver. EX equipped with front and side air bags and 4 wheel disc brakes good crash safety ratings. Handles well in correction manuevers at high speeds. The safety features on the car are great, and the brakes perform pretty well, with decent feedback. On the test drive I tried the brakes by stopping fast. There was a good reaction time. The body is highly rated for all around protection. The brakes, for a given amount of force applied to the pedal, seem to produce less stopping power than brakes of other cars. It was disconcerting to stop quickly in traffic. Airbags, anti-lock brakes, 4 wheel disc brakes. Air bag cocoon is standard. Brakes are accurate as is the steering. The frame is designed to give a very tight turn radius and is excellent for fast parallel parking. Side airbags only available on expensive high-end model. 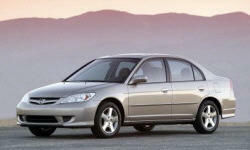 It was cheaper to get a base model Accord which had 6 airbags and ABS standard. See TrueDelta's information for all Sedans, Coupes, and Hatchbacks.